Bethesda Chapel our place of worship in Kenya is located inside the Tenwek Hospital Compound. 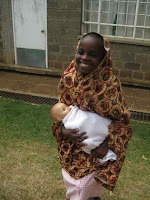 Bethesda Chapel is attended by hospital staff, visitors, and our friends the Kipsigis. Sara was immediately added to the worship team. She plays preludes, hymns, praise music, offeratories...and sometimes wearing Scrubs when she is on call. I have joined the team as a Conga player. 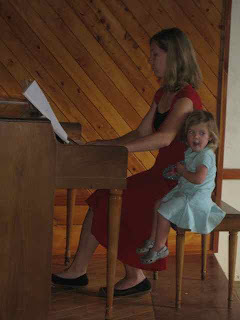 The services can be long, so occasionally Meredith joins Mom on the piano to "turn pages." Amelia has learned to hold a hymnal and find the right page. The worship music is combined English and Swahilli, but thankfully the sermon is in English. The second picture was taken on December 25th. This is our Mary holding baby Jesus. A reminder that the Incarnation is real and relevant to every tribe and nation. I can just hear this beautiful worship. What a good work you are all doing.